Even before it hit newsstands, Rolling Stone's latest cover caused controversy: It features a full-page photograph of alleged Boston bomber Dzhokhar Tsarnaev sulking, his curly hair messily tossed in front of his eyes. As soon as Rolling Stone posted the cover on Facebook, it was inundated with negative comments: "I think it's wrong to make celebrities out of these people. Why give the guy the cover of Rolling Stone?" one Facebook user said, echoing thousands of others. 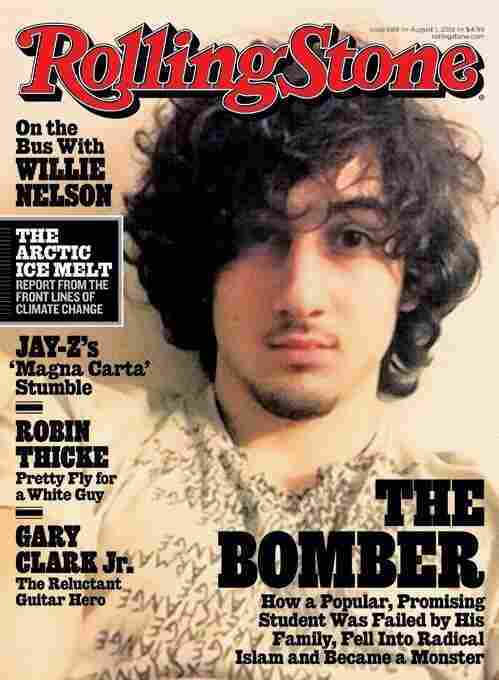 The editor of the liberal Think Progress tweeted that the cover turned Tsarnaev "into Jim Morrison." Others opined that the cover wasn't offensive, just "uninspired." "How a Popular, Promising Student Was Failed by His Family, Fell Into Radical Islam and Became a Monster," it reads. Essentially, Leonard argued, white men are profiled as innocent by society, and when something goes wrong, something outside of them must be to blame. Leonard was reacting to the portrayal of Adam Lanza as a quiet and bright boy described as "nice" by some. "In fact, the media response to mass shootings often reimagines white men as victims. "The national spectacle and the hyper focus on Newtown and Aurora especially in comparison to the scant coverage afforded to murders in Chicago or drone deaths in South Waziristan points to the value of whiteness. School shootings and other mass killings matter when there are white victims. Whiteness is thus reimagined as under attack. White suburban kids, white suburban families, white suburban communities and even white shooters are the victims — victims of Hollywood, victims of gun laws that don't allow them to protect themselves in every context, victims of removal of prayer from public schools, and victims of soiling culture." To be fair, Rolling Stone's full story is not yet available as we publish this post. (Note at 5:30 p.m. ET: It's now online here.) But the framing of the story follows the pattern Leonard is talking about. 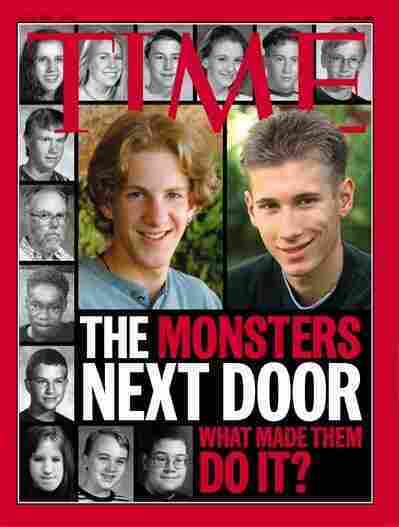 It's a narrative reminiscent of one put forth by Time magazine's cover featuring Columbine shooters Dylan Klebold and Eric Harris. The headline asked: "The Monsters Next Door. What Made Them Do It?" We reached out to Leonard because we're guessing the Tsarnaev case puts wrinkles in his thinking. The Tsarnaev brothers, after all, represent an unlikely middle for America. They're white, but Muslim. We'll update this post once we hear back from Leonard on that point. Meanwhile we ask you: Is the Rolling Stone cover ill-conceived? What do you think about the framing? "And yet a deeply fractured boy lay under that facade; a witness to all of his family's attempts at a better life as well as to their deep bitterness when those efforts failed and their dreams proved unattainable. As each small disappointment wore on his family, ultimately ripping them apart, it also furthered Jahar's own disintegration — a series of quiet yet powerful body punches. No one saw a thing. 'I knew this kid, and he was a good kid,' Payack says, sadly. 'And, apparently, he's also a monster.' "
Saying that the cover photo is an "apt image because part of what the story is about is what an incredibly normal kid [Tsarnaev] seemed like to those who knew him best back in Cambridge [Mass. ]," Rolling Stone managing editor Will Dana talked with All Things Considered host Melissa Block this afternoon. "I am completely comfortable about the decision that we made," he said of the cover photo. Dana sees the story Rolling Stone told as one of how a "seemingly normal, well-adjusted guy who appeared to be on a path — if not to achievement — at least to success" turned into "a monster" instead. And he believes that "if people read the story they'll see that there's nothing in here that's trying to build him [Tsarnaev] up as a hero." We'll add the as-broadcast version of the interview with Dana to the top of this post later today. "Beyond the fact that I don't think the cover 'glorifies' Tsarnaev or portrays him as a rock star, I think the controversy focuses on the wrong issue. ... [The question should be] why is there an effort to explain how a 'promising student was failed by his family, fell into radical Islam and became a monster.' Or better said, how a suburban white [boy] (from the Caucus region) came to commit such heinous crimes. The picture and the headline operates through this vision that he was good, he was the boy next door, and that something changed him. The picture in this regard (as it was a picture from before the bombing) harkens his past, what he was like before his turn toward evil. It fits the common narrative afforded to the suburban, white male domestic terrorists. "At the same time, I wonder how much outrage the Columbine cover you referenced or the covers picturing Adam Lanza or [alleged Aurora, Colo. shooter] James Holmes elicited in terms of 'glorification' and turning 'killers into celebrities.' The fact that the images of these individuals did not prompt outrage reflects a willingness to see a level of innocence and how race, class, and religion all plays out here. This shows how many readers don't see Tsarnaev as white; he is different in their imagination from Lanza, Holmes, Kleebold and others."